Perception is the byword in Primary Stages' 20th anniversary production of David Ives' very enjoyable All in the Timing, a collection of six one-act intellectual comedies where words are king. Each piece demonstrating not only the power of the playwright's fertile and at times fevered imagination, but also providing a telling look at the characters and situations in each of the individual stories. Things start off nicely with Sure Thing, where Bill (Carson Elrod) and Betty (Liv Rooth) meet at a café one Friday night. She's sitting alone reading a book, he joins her and the two begin a verbal dance of introduction and flirtation. One continually interrupted by a bell every time one of them says the wrong thing, thus giving them a chance to do that portion of their speech over again. Cute and funny, if a little lightweight, the idea works not so much due to the actors' amiable performances, bur rather because just about everybody can relate to the situation presented. After all, who wouldn't love the chance to go back a few seconds in time and take back something that happened to fly out of their mouth at the wrong moment? Next up is the absolutely hysterical Words, Words, Words which stems from the theory that if you put a monkey in front of a typewriter they will eventually produce Hamlet. 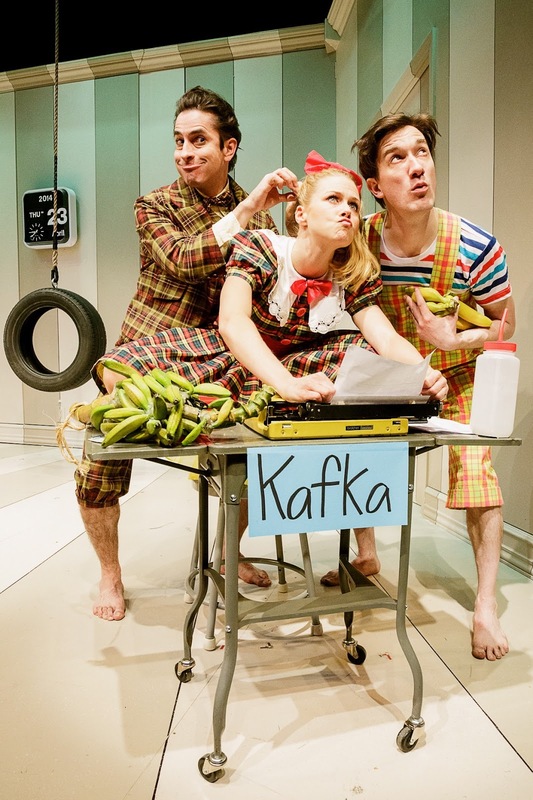 Elrod, Rooth and Matthew Saldivar play monkeys Swift, Kafka and Milton who are trying to do just that, even though they have no idea of what Hamlet is. In between complaining about their situation, making fun of the humans watching them, and wondering if there's a way to escape, they often wax surprisingly poetical before breaking into very familiar monkey-like movements and gestures. All three actors are especially good here. Elrod strikes the right note as the angry and rebellious Swift; Saldivar is fine as the more somber and introspective Milton; and Rooth does a good job as Kafka, who just kind of goes along with the program as best she can. Best of all are their antics and actions that make the play come fully alive in a situation that is funny beyond belief. The most touchingly humorous piece of the bunch would have to be The Universal Language where Dawn (Jenn Harris), a young woman who has a stuttering problem, decides to take a course in a language called "Unamunda". Said course, of which she is the only student, is taught by Don (Elrod), a fellow who converses mostly in this unfamiliar tongue. Nevertheless Dawn soon finds to her delight that not only can she quickly understand this new language, but she also loses all traces of her stutter when she starts speaking it herself. However Don may have an ulterior motive hidden beneath the Unamunda jargon, one which may derail Dawn's new-found happiness. The text combines elements of both the intellectual and the emotional as the audience must carefully listen to what is being said in order to decipher it; thus allowing them to relate both to the story, as well as the loneliness and alienation Dawn is feeling. 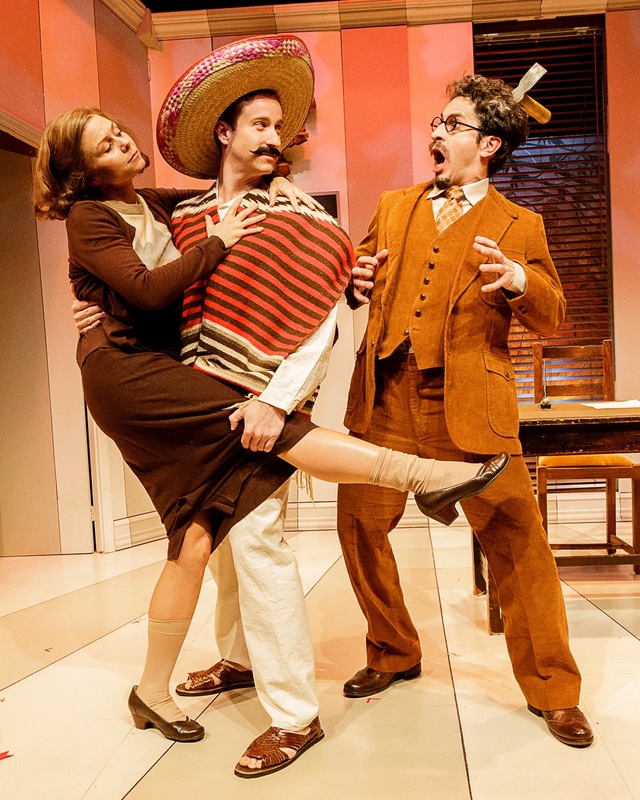 Both Harris and Elrod embody their characters perfectly, with neither afraid to look somewhat silly in order to get the play's message across. Also in the cast is Eric Clem. The second half of the show begins with the most existential piece of collection, where the composer Philip Glass Buys A Loaf of Bread. Once that premise is set up - with a few quick lines of dialogue, taking all about four seconds - the reality of the piece begins to change. The participants in the story (Clem, Rooth, Harris, Saldivar and Elrod) continually reenacting the opening words and moments of the play via different movements and actions, all the while slowing down or speeding up their gestures and speech. At one point the piece visually resembling a Philip Glass composition. An interesting acting exercise and quite a lot of fun to watch, Philip Glass Buys A Loaf of Bread shows perfectly how one can take a simple idea and make an entire play out of it, one that grabs and holds the audience's attention. The words, music and movements all coming wonderfully together. Lovingly satirical with a wink and nudge to its subject matter, the one-act The Philadelphia is perfect for anyone who feels like their lives have gone totally wrong. Mark (Elrod) finds himself in such a situation, having a bad day like none other. However as his laid-back friend Al (Saldivar) tells him, Mark isn't having a bad day, rather he's having a Philadelphia. A kind of mental and literal fugue where nothing can turn out the way he hopes. Al meanwhile is having a Los Angeles, which explains his rather calm attitude. An interesting look at culture clichés where mostly nothing said is what it seems, the fun comes from Mark first trying to comprehend his situation and then trying to turn it to his advantage. Also in the cast is Harris who has a nice part as a semi-unsuspecting waitress. The final piece of the group is rooted in historical fact, as it deals with Variations on the Death of Trotsky, who on August 20, 1940 had his skull smashed in with a mountain climber's ax and died the next day. 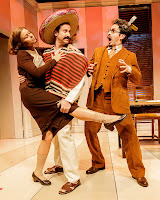 The story begins on August 21st with the ax sticking out of Trotsky's (Saldivar) head as he and his wife (Rooth), with some assistance from their gardener, Ramon (Clem) try to figure out why this act of violence was perpetrated on him. Just who did the deed is never in question. As with Sure Thing, moments (i.e. variations) are replayed again and again as the mystery is at least partially unraveled. Brimming with black humor and double takes. the piece, while quite funny at times, also has an overall somber feeling to it as the Trotskys try to make the most of however much time they have left together. This final story also is a nice bookend to the first one-act of this group; Sure Thing being a play about beginnings, Trotsky being one about endings. The three actors in Trotsky do a good job, especially Saldivar with his reactions whenever an ice pick is mentioned. Though again, the words of the work and what they all represent are the true stars here. Direction by John Rando is superb throughout, taking each piece up to the edge of parody at times still but keeping it grounded in the human condition. More importantly, all of the one-acts have a nice, compact feel, with none overstaying their welcome. Beowulf Boritt's set is excellent, the stage looking at the beginning almost cartoonish. The show also starts out with six clocks on the wall, each showing a different time, and each of which appears in one of the six works. The sound design by Ryan Rumery is especially on-target, particularly with the bell effect; and the costumes by Anita Yavich all worked well, with her work shown best in Words, Words, Words. Wonderfully done from start to finish, All In The Timing is a bright comic treat and one definitely worth seeing.